After the Ram 1500 with the EcoDiesel became the most fuel-efficient configuration in the half-ton segment, it has been expected that Ford’s small diesel would be engineered to claim the title as the segment’s best truck in terms of MPGs. 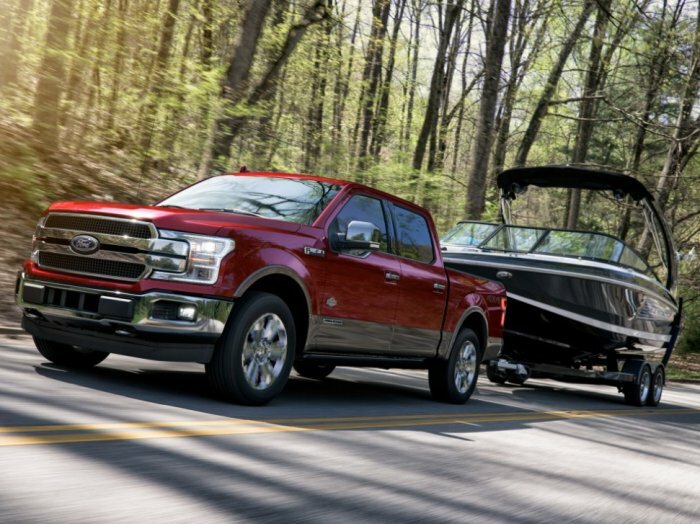 Although the F-150 with the 2.7-liter EcoBoost led the gasoline-powered pickups, the Motor Company wanted to be the overall leader in half-ton fuel economy. Today, that goal was achieved. Hot off of the presses, here are the official EPA figures for the 2019 Ford F-150 with the new 3.0-liter PowerStroke V6 diesel engine. Ford has issued three different sets of numbers – one set for 4x2 models, one set for 4x4 retail models and one set for 4x4 fleet models. In rear-wheel-drive trim, the 2018 Ford F-150 with the PowerStroke diesel engine offers 22 miles per gallon in the city, 30mpg on the highway and 25mpg combined. In four-wheel-drive trim retail models of the 2018 F-150, including Lariat and above, the PowerStroke-powered half-ton pickup achieves 20mpg in the city, 25mpg on the highway and 22mpg combined. Finally, in the four-wheel-drive fleet models of the 2018 F-150, including the XL and XLT, the new diesel engine will return fuel economy figures of 21mpg in the city, 28mpg on the highway and 24mpg combined. In the modern era of the half-ton pickup, never before has a truck achieved 30 miles per gallon, so in addition to leading the segment right now, this is effectively the most fuel efficient full-sized truck to date. The 2018 F-150 beats out the 2018 Ram 1500 with the EcoDiesel engine, which gets 27 miles per gallon on the highway. Of course, it should be noted that we mention the fuel economy numbers for the 2018 Ram 1500 because the next generation Ram 1500 was introduced for the 2019 model year and those trucks are reaching dealers now. However, the EcoDiesel engine will be a late availability option and right now, we don’t have any numbers on the new half-ton diesel engine option from the Ram brand. In the truck segment, it is a constant battle of one-upping the competitors, so when the EcoDiesel Ram 1500 arrives later this year, we expect that it will challenge Ford’s new PowerStroke, but in the meantime, the F-150 offers the best overall fuel economy figures in the full-size truck segment. The 2019 Ford F-150 with the PowerStroke diesel engine might be the most fuel efficient truck in the segment, but it is more than just a fuel-saver. The new 3.0-liter PowerStroke offers best-in-class diesel power of 250 horsepower and 440 lb-ft of torque, best-in-class diesel towing of 11,400 pounds and best-in-class hauling figures of 2,020 pounds. The 2018 Ford F-150 with the new PowerStroke diesel will begin reaching dealerships this summer. I've got a 2015 F150 XL, 2WD, std cab, shortbed, 3.31 gearing with just a few options. I get from 23.5-24.5 mpg commuting real world. The EPA estimate is 19/26/22. Premium for the 375 peak ft-lb torque engine at 3000 RPM was $800. A 2018 model configured just like mine comes with ten speed is estimated with one higher in the city; has 400 ft- lb torque at 2750 RPM and starts at about $29.6K including destination. A retail customer who wants a diesel but in a basic truck is out of luck. A 30 mpg pickup will be priced at $46K minimum. The case for a diesel makes the most sense for those looking at King Ranch and up where the premium drops below $4K, but then you'd have a really massive, tall, heavy truck with 250 HP. The diesel would be a good fit for the smaller, lighter configurations for value-conscious buyers, but those prospective buyers don't even get the diesel choice. They are just too expensive to build and certify for them to make much sense in half tons, and if they tried a more capable diesel worthy of a massive pickup, it'd be even more expensive, would get mediocre mpg lije they do in the heavy class, and payload would be near nothing, because a heavy diesel would put it near the GVWR limit before adding cargo. That's why Nissan had to invent the XD. The writer probably should have noted that is likely or at least possible that GM will have the next diesel for half-tons: Silverado and Sierra before Ram makes available their Ecodiesel for their new-generation truck. GM has previously announced that their all-new, upcoming 2019 Silverado and Sierra, which will cut at least twice the weight as did Ram for their all new attempt, will be available with an all-new-American designed and American-built Duramax 3.0L inline six cylinder. This will be the latest and greatest diesel for a pickup truck on the planet and will likely be available before the next-generation Ecodiesel. The fact that GM is going with an inline configuration hints towards them trying to save on costs, and in the world of light-duty diesels, a cheaper to build and certify diesel engine could be a game changer; especially if they can save money and also meet the performance and capability demands of the consumer. And since this will be a clean-sheet design with the ability of GM to use the very latest and greatest advancements in diesel engine technologies for both performance and cost savings, it is likely that GM will have an advantage over the competition except that they left some weight savings on the table by not using aluminum for all the body panels. Why do I bring up weight? When it comes to offering a diesel for a half-ton truck, having lower weight for the chassis, body, frame, transmission, etc. is very important to the max payload possible, because diesel engines are heavy and that works against possible max payload numbers since 1/2-tons must come in under 8501 GVWR. This is why Ford's lowering of up to 700 pounds on the F150 back in 2015 will pay dividends for them way above what is possible for Ram who chose not to cut much weight. Moreover, GM is cutting roughly double what Ram did with their latest truck, and that will also give them a huge advantage moving forward over Ram. A diesel-powered pickup that can't haul much weight is almost a pointless offering. This is why we don't see bigger diesels in half-tons, which many have been calling for not understanding the dilemma. This is why Ford spokespersons were so excited about their cutting of substantial weight back in 2015, and this is why they stated that the "hard work has already been done" when they made that aluminum move. F150 Powerstroke has a max payload of 2020; Ram's is almost 500 pounds less in the previous generation truck. That's a huge number. And really, there is little Ram can do about this at this point since they chose not to at least go with aluminum for all hinged panels (as GM will do) or go with all aluminum body (as Ford did in 2015). They could go back and redo the doors with aluminum, but if they do that it will be a huge cost and effort, and so it's likely they'll just stick with the heavy truck that they created in a next-generation pickup that cut only 225 pounds in it's maximum weight-cut configuration. We're already seeing one of the downsides of Ram's decision to go the easy and cheap path on the body; the new Ram truck with the same Hemi engine, with the same performance numbers as before, comes in at just about exactly the same mpg as before; not exactly advancement for the consumer. Yes it's all new; yes, it's likely more refined and has less drag; yes it has new styling, but it's still going to be about the 3rd or 4th worst 1/2-ton pickup for fuel economy on the planet and no more performance to show for it. Adding the 3.0L Powerstroke for F150 adds approximately 388 pounds over the weight of a comparably-equipped pickup with the 3.5L Ecoboost, and it should be noted that Ford's larger Ecoboost is their next-most heavy engine. The 3.5L Ecoboost is heavier than the 2.7L, the 5.0V8 and much heavier than the base, naturally-aspired, all-aluminum 3.3L V6. For instance, if you look at F150 stat sheet, the lightest possible truck/engine combination is the F150 standard cab, 2WD XL, short bed at or about 4057 pounds. Add the 2.7L Ecoboost and the least weighty version jumps to 4166, the 5.0 is just a few pounds more than that, and then add the 3.5L Ecoboost, and add even more (note: the 3.5L is not available in the short bed). So if we consider that the small diesel is 388 pounds heavier than the next-heaviest F150 of equal configuration and trim level, then compared to the base engine, it's going to be at least 500 pounds heavier not counting the extra weight from the higher trim level required for the diesel. So when you add all this extra weight of the diesel; you then require a Super Cab configuration and a Lariat trim as a minimum to make it sensible from a value standpoint, then you start getting very close to that 8500 weight limit. However, if you managed to cut up to 700 pounds from your truck by virtue of aluminum body and high-strength steel frame and other hard engineering, then you can market a much more capable diesel half-ton truck. Ford has done this; to a lesser degree, GM has done this. Ram did not do this. They'll still sell well as they have many loyalists, and they have another alternative, which is to offer their diesel in the regular cabs to shave some weight so as to add in some higher payload with the diesel. But as of right now, Ram is not planning on offering regular cabs in the next-generation truck. So I'm not sure what they're thinking, but at least they are doing much more than Tundra engineers. I'm beginning to wonder if there are Tundra engineers.